Hi there Lawnscapping fans and you should be arriving here from the lovely Sabine's blog! 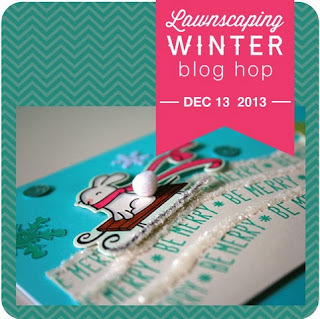 If you got lost or would like to start from the beginning of the blog hop you will find the complete list at the the Lawnscaping blog. Make sure that you comment all the way along the blog hop as there are lots of fabulous prizes to be won! All the specific information about the sponsors and prizes can be found on the Lawnscaping blog home page. Everyone will have until Sunday, 12/15 at 11:59PM EST to leave comments to be eligible for a prize. 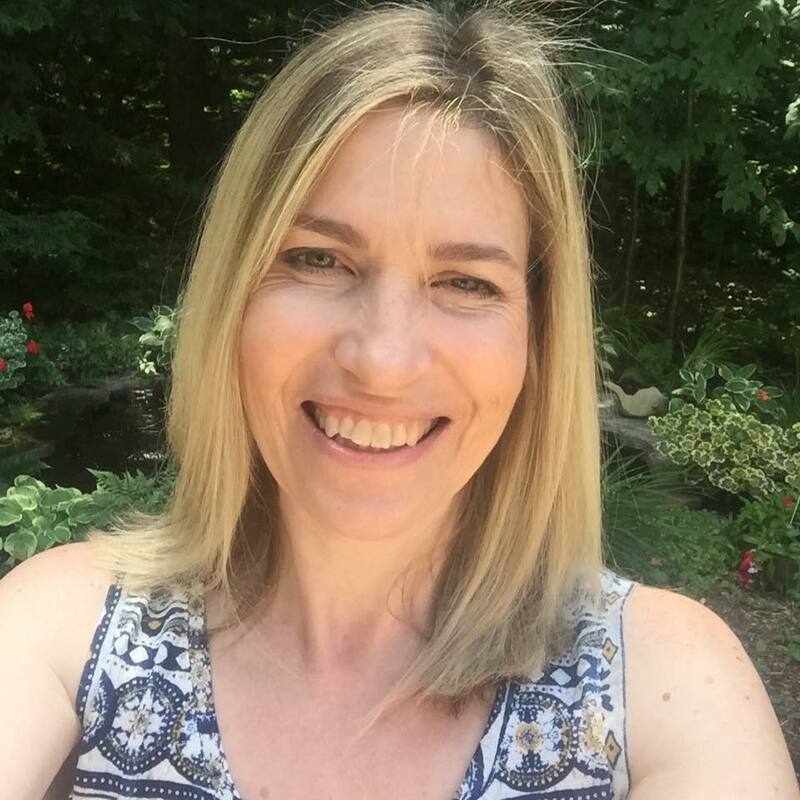 Next stop on the hop is my fabulous friend Amy's blog! This is a happy trio and it makes me happy to see them!! Love the peppermint stripe and the blue sky!! oh my goodness Tracey, how absolutely adorable! Love those sweet birds, your coloring is wonderful and they simply pop against that blue panel. Very cute card! I love the clean layout, and the scene is just precious! Such a "TWEET" design!! :) Love the little musical notes above their heads and your layout is fabulous! Thanks for sharing! This is fantastic and my favorite color scheme! This one made me say ooooo, as soon as I saw it. Great job! Adorable. I just can't get enough of those winter sparrows! These are the cutest. I love the one on the sled! Adorable! Those birds are too cute! so sweet :) i love the color combo for this card! happy to have you on the hop!! 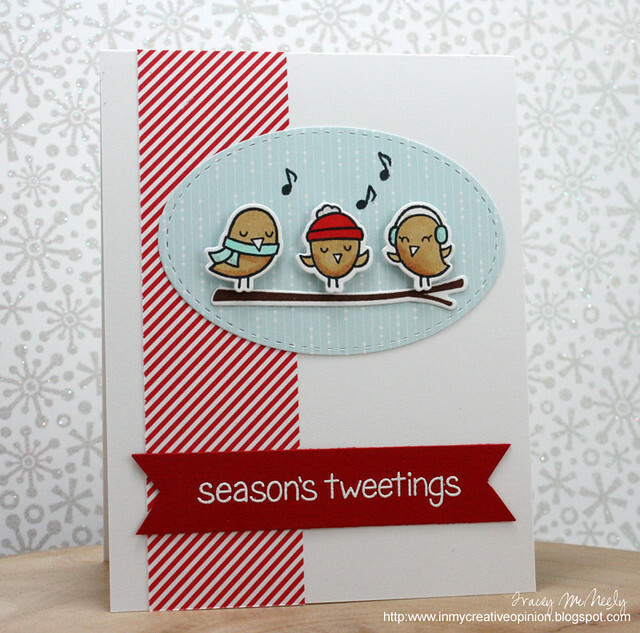 Such a cute card Tracey, love those little caroling birds decked out in the winter gear! This card is darling, Tracey! gotta love those sparrows!!! cute card! Super duper cute card and a great color scheme too! I love the colors! The birds are so sweet. I feel like they are at my door step singing me a song. Ohhhh! Less is more and your card is gorgeous! Love how you used the patterns and yet kept it so clean. Awesome job! SWEET card, love the red & white candy cane stripes! Just love LF critters and these birdies are just the cutest things!!!! Love your card. This is adorable! Love the colours. very sweet - love these birds! Super cute. I love those little birds. I just adore the cas look of this card.. The red is the perfect pop of color and the layout is perfect! Aww! Cute card! Love the birds! Love this beautiful CAS design, pretty color palette too!! Ah my lovely Tracey! So glad you are on this hop and so happy to see your sweet and clean card! So cute! I am fan of these small birds ! They are really too nice ! This is so sweet!! Was a pleasure creating alongside of you today! These little song birds are the cutest. Fabulous card tracey. Really beautiful clean design! The birds are adorable! Beautiful card! I love the pattern paper combination! And those birds are so cute! So cute. I have to have this stamp. This card made me smile. Like the birdies. Oh,the birds are just to tweet! aw, love those sweet birds!! (i imagine they're singing some christmas carols! ha ha!) the red striped paper and the red banner is the PERFECT compliment to that sweet scene too!! i LOOOOOOVE this card design!! beautiful! I really need to get these birds after seeing all the fabulous cards on this hop! Really cute card. These birds are so sweet! Great card, Tracey. I love those birds! The colours you've chosen are so pretty. So beautiful! I loveeeeee those birds!!!! Super gorgeous card Tracey - LOVE, LOVE, LOVE!!! This card is so cute! I love the birdies. Really cute card - I can almost hear the birds singing!!! Oh how adorable. I love those sweet little tweeting birds! So, so cute! Love your card! Beautiful card Tracey - I love everything about it. Those are the cutest little birdies ever. Such a darling card! Tracey--this is just too cute. I see you have broken out your stitched ovals, too. Now, I want those birdies. Very cute. I can almost hear them crooning White Christmas. Love the colors and sweet little tweets! :) TFS! Love the simplicity of the card, very cute. Love the saying to your card...put a smile on my face!! Very sweet card! Such a sweet card. I love those little birds! I just love these sweet birds. They are so cute :) Thanks for sharing. Beautiful CAS card, perfect execution! Love those sweet birds! What a sweet card...love the oval mat and the stripped paper. Your card is so lovely & sweet. The color combo is my favorite and your birdies are so cute. I love love love this card. The birds are soooo cute. Very sweet birds. Love the card. This is so adorable and elegant. Love your card! Love the CAS design, and sweet little birdies. Cute card!! Oh I just love these birds. Your CAS card is just adorable. I Love the sweet card! great colors! Oh my! Your card is so adorable! Those sparrows are so cute and your color choices are perfect! Oh my! Your card is adorable! Those sparrows are so cute and your color choices are perfect! Cute birds. I like the embossed sentiment. Very sweet card. Love the birds and the clean look of the card. I agree. Those little sparrows make me happy, and I love the red and white striped paper. Such a cute card. These birds are just too adorable!!!! Adorable card - love those birdies! Lovely card - very tweet! LOVE your card! Perfect patterned papers and those little guys are soooooo adorable! Love the simplicity of this card beautiful! I need to add that stamp set to my wish list!!! Super cute! Simple and Sweet are my Favorite! Very nice job, thanks for sharing and the chance! Oh, this is so sweet, Tracey! I love the simplicity of the trio of birds singing. You've inspired me! I love your adorable card Tracey! These little birds are just so cute! So pretty, love the clean crisp look of this card! Love this CAS card! So pretty! I have this very same stamp set and dies! I love love love this card! So very sweet and simple to reproduce, yet very creative...thank you for the inspirations. Love your little birds! Very cute card! These singing birds are so nice. Love the little birds! Such a CAS card! love the design on the oval! I adore this! I just pulled out this set to use today on some cards! Dear little birdies are very cute, thanks for sharing. This is really an adorable card. Just love how the blue pops against the red strips. Really cute card. Your card is really beautiful! I love the singing birds and the color combination you have used! Thank you for sharing! How cute!!! The birdies are adorable and paired with the sentiment it is just precious! What a cute Card. I love the CAS style! Adorable Tracey! Love the strip of striped paper to the side of the card. Love the CAS feel of the card. The little trio of birdies are adorable. Such a cute card. I love your birds. 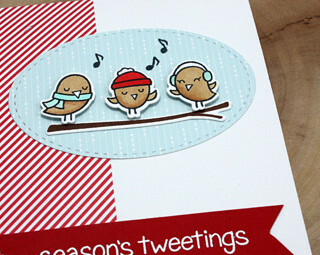 i love these little birdies on your sweet card! im sure they sing the best christmas carols! Well I'm sure one of these 135 commenters has told you that this card is the Tweetest ever! Really love it, Tracey! This is so super sweet! Love the colors! This birds trio is adorable! Thanks for this fun card! Love how you put those little birds in that oval shape. Love how you placed those little birds in the oval shape. love the sentiment and the oval die, they are on my shopping list! Love the layout of your card! Those birds are so sweet! Absolutely darling card, Tracey! Beautiful coloring, too! Wooow! Totally loooove your card!! Great design and beautiful color combo! !